Members of the Colton Fire Department had been fighting a fire in La Loma Hills, California, for eight hours straight on Saturday before taking a break and heading to a local Denny’s for dinner. While eating, an anonymous woman told the Denny’s staff that she wanted to buy all of the firefighter’s meals — there were 25 firefighters in the restaurant at that time. 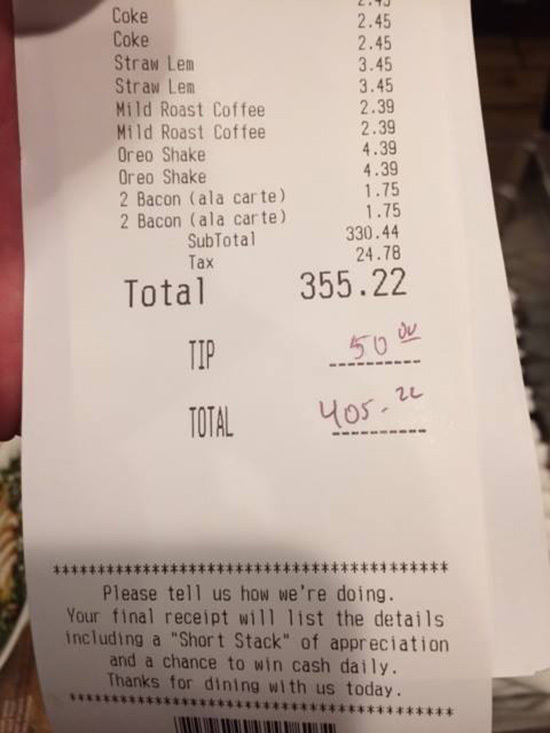 She paid $355 for food, plus a $50 tip, and got a $100 gift card to buy dessert for the next round of arriving firefighters. By the time the waitstaff had told the firefighters, the woman was already gone.